Because when I originally installed the corner cabinet, I had brought the water supply lines up in a bad spot, so I put a pair of 90° elbows in the lines to shift them over, which somewhat restricted the water flow. So I thought I’d simply drill new holes and rerun the lines without the extra jog. This required that I shut off the water farther back up the line, but when I went to turn the valve off, the handle snapped off in my hand, necessitating having to cut out the old valve and replace with a new whole section of pipe, T-fittings and a new valve. When I went to drain the line into a bucket, and subsequently poured the contents into the sump pump, the pump motor was seized up (glad we’d not had a lot of rain lately! ), necessitating replacing the 6-month old pump with another new one (trip number two to Menards). After getting all that squared away, I got my holes drilled, lines run, and faucet set into the sink, at which point I realized the fittings on the new faucet were a different size from those on the old, necessitating trip number three to Menards (for a $3 valve). 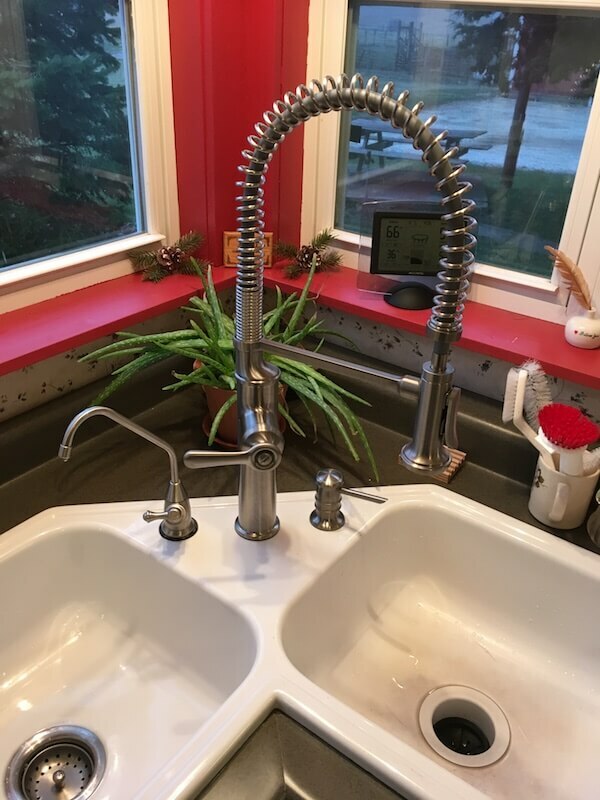 Thankfully, nothing leaked when I turned the water back on, so after two days and three trips for plumbing supplies, we have a new faucet with good water pressure!